I hope everyone had a lovely Valentine's Day yesterday. We sure did! You can see some of our favorite ooey gooey chocolate recipes in this post. I made our Valentine's Heart-shaped Meatball Subs and Brownie Volcano for my crew last night. Delicious! I'm sharing another older post about making basic store-bought t-shirts into something much cuter. Now that Isabelle is older, I don't typically embellish her clothing like this, but when she was little, it was absolutely adorable. You should try it! The easiest method is to attach a single or double ruffle along the hem. If using a knit, don't even worry about hemming the ruffle; otherwise, make a narrow hem along the ruffle edges before sewing onto the shirt. Add two bows if you want, tack them in place by hand, and you've got a very sweet t-shirt for a little girl. Be sure to put some Fray Check on the edges of the ribbon so they don't fray. The next shirt was slightly more complicated because it involved having to keep a straight line while sewing. I marked off where the ruffle was going with some chalk, so it was no big deal. 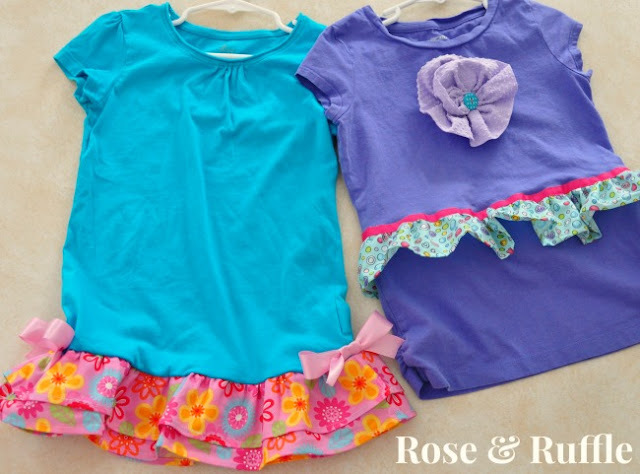 The biggest difference with this method is that you can sew the ruffle directly onto the shirt without first having right sides together. 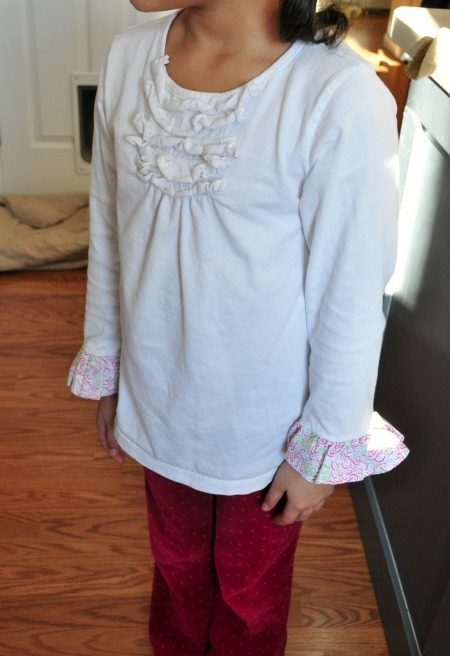 Simply sew the ruffle onto the shirt as it appears above- you're going to cover that raw edge with the ribbon! After you've sewed the ruffle onto the top of the shirt, place the ribbon along that raw edge, making sure to cover it completely; top-stitch the entire way around, both top and bottom of the ribbon. We also went through a big rosette phase, ha. This can be omitted, but it does look really cute. You cut a rectangular strip of cloth, fold it down, and then cut tapering curves each end, like a stretched out "C." Run a basting stitch through the raw edge to gather up the rosette. I do this by hand. Then, getting the center as tight as you can, tack it by hand to the shirt. I usually place a small piece of leftover fabric or some interfacing to the inside of the shirt where I stitch something heavier to give it some support. Leave as is or finish with a button in the center. So, so cute! I cannot find a picture of Isabelle wearing them, and learn from my mistake: don't bother trying to embellish a too-small shirt. I do remember that they were already a bit small, and so she really didn't get much wear out of them afterwards. Oops. Lastly, this was a fun, easy little addition. Using the same method as making the ruffles above, cut shorter ones to sew onto the wrists of the shirt. It's most helpful to use your narrow arm of the sewing machine, as the sleeve will fit right around it. Otherwise, just be careful not to sew the edges of the sleeves closed when sewing on the ruffle. Sew them right sides together, or use the method with the ribbon for a different look. I'm sure you're feeling heartbroken and overwhelmed with the news of yet another senseless tragedy, so let's remember to be the LIGHT in our dark world. Be thoughtful and kind, no matter whether others deserve it or not.